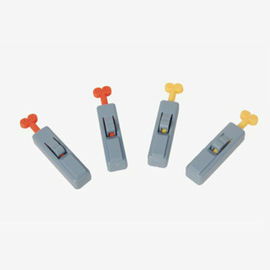 extremely easy and comfortable way to obtain a capillary blood sample. It is designed to ensure the highest level of safety for the healthcare professional and their patients. There is no need to load the lancet or prime the device prior to use. You simply twist off the protective cap and the device is ready for use. Safety Lancet needlepoint is hidden before use and automatically retracts after use to avoid needlestick injuries and cross infection. Safety Lancet had additional visual lockout feature. Should an attempt be made to misuse the device by trying to re-prime the lace there is a clear indication to the operator that the device has been used and should be disposed of in a suitable sharps container.